Whispered in the language of the dead, tales of 106 famous and infamous women of ancient times breathe new life in this inaugural edition of the Harvard I Tatti Renaissance Library’s Famous Women. 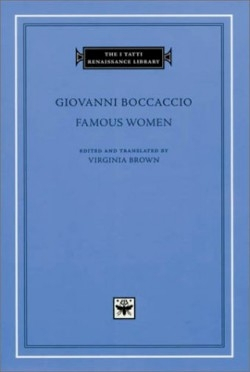 Joining Bruni’s History of the Florentine People, which provided the template for all modern works of history, and Ficino’s philosophical Platonic Theology, Giovanni Boccaccio’s book emerges as the earliest amalgam of biographies celebrating and describing the deeds of women exclusively, flushed with the timeless air of antiquity. A poet and fabler, and author of the celebrated Decameron, Boccaccio here emulates Petrarch, a humanist and personal friend famous for his Lives of Famous Men. Boccaccio, a Renaissance Italian consumed with the reintroduction of Graeco-Roman literature, penned Famous Women in Latin near the end of his days. The result, in its first English translation, bridges the boundaries of language and fosters the perpetual rediscovery of Renaissance intellectualism. Coupling the Latin text with a faithful English translation on the facing page, the tales average three to five pages each. In a strong narrator’s tone, many of the stories conclude with an ethical summary or moral, which illustrates the Renaissance humanist movement’s effort to infuse the virtues of classical literature into the minds of coming Italian leaders. Depicting queens, goddesses, mythological women of Greek and Roman origin, Biblical and post-classical figures, Famous Women provides a fascinating glimpse into distant hearts and minds—successfully bridging the chasms of both time and tongue.